When Life Throws You a Curve | Train Positive Dog! Just about two months ago, my 2 year old dog, Deagan, was diagnosed with idiopathic megaesophagus – a rare disorder that means his esophagus (the tube that goes from the mouth to the stomach) is enlarged and not able to swallow normally. It means he has to eat and drink in an upright position (and stay in that position for a while) so that gravity can help the food and water go down. If he is left to eat and drink like a normal dog, he will regurgitate and possibly inhale the food or water, risking life-threatening pneumonia. It means he has to eat several small meals per day made of soft food mixed with water; not eat anything else – no treats, no chew bones; stay away from ponds, streams, puddles, or any open water, and avoid dehydration. Sometimes, this disorder is caused by another serious health problem such as Chagas disease, Addison’s disease, myosthenia gravis, or polymyositis. “Idiopathic” means the cause for Deagan is unknown. There is no proscribed medical treatment that will cure this condition. When Deagan’s diagnosis was confirmed, I really wasn’t sure I was up to this challenge. There is a Yahoo group for dogs with this condition, and I read messages about dogs with multiple health issues, bouts of life-threatening pneumonia, and visits to emergency vet hospitals. Not what I had planned for this dog. Deagan is a Large Munsterlander, a hunt, point, and retrieve breed – a breed that is very active, and does, indeed, need a job to do in order to be content. Deagan’s job was to be a hunting dog and agility dog, as my previous two Large Munsterlanders had been. I didn’t see how these activities could be possible with the limitations imposed by the megaesophagus condition. The situation was very discouraging and overwhelming. I had put so much time and energy into working on Deagan’s impulsive behaviors. I was feeling great about how much progress Deagan and I had made and now, this. Well, as Winston Churchill famously said, “if you’re going through hell, keep going.” I learned as much as I could about the disorder. We started feeding Deagan frequent small meals while he stood on stairs, and started acupuncture treatments, probiotics, and enzyme supplements to help his digestion. He was able to keep his food down, and began to gain back weight he lost before we knew what was wrong. Fortunately, Deagan does not have other complications at this time, and his condition is not as severe as some other dogs. 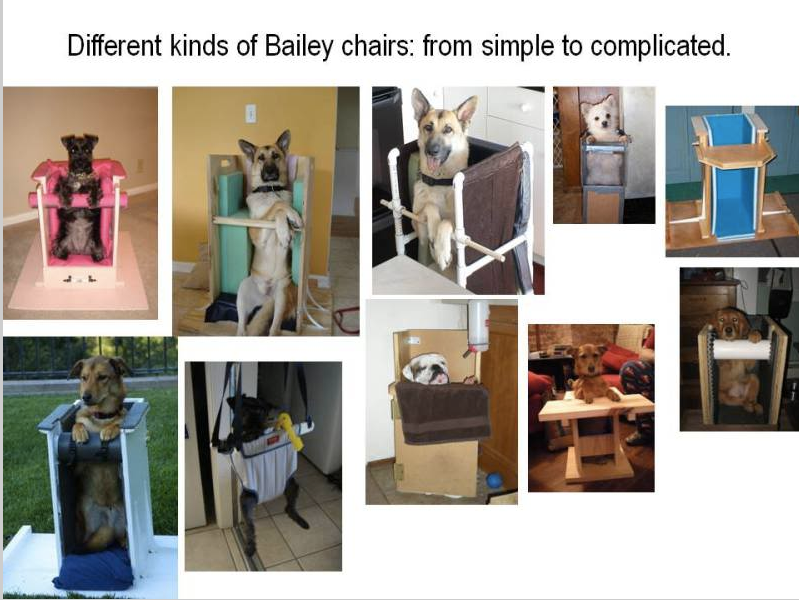 The megaesophagus Yahoo group – which, as I continued to read it, was a source of hope more than horror – provided plants to construct a Bailey chair to keep his body vertical during feedings (see below), named after a dog with megaesophagus who lived a relatively normal life for many years. And so it goes – a relatively normal life – with some limitations. Deagan does not suffer from his enlarged esophagus as long as we are careful to “follow the rules” of how he can take in food and water, avoid dehydration, and stay away from open water (he doesn’t really like swimming, anyway). Deagan can still run, and play, and look for birds. And most importantly, he can still be our bright-eyed, cheerful companion. We have much to do and to learn together. Training has been interrupted this summer, but grouse season starts next week, and we will be out there. What Can a Dog Do?